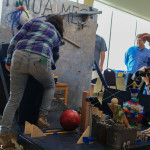 The Shepherd Union ballrooms transformed into a young engineer’s paradise Friday as Weber State University hosted the 2015 Rube Goldberg challenge, which could be considered a DIY mechanism building competition. The event began at noon and lasted for two hours, with teams from junior high and high school levels competing. Separate divisions were held for junior high and high school level. “It is going to get bigger because last year, we had three teams competing, and this year, we have 10 teams,” Fran Bradshaw, part of the local Air Force Association and one of the event coordinators, remarked. There were 10 teams that participated overall with five teams in the high school division and five teams in the junior high division. The teams consisted of local participants, who traveled from as far as Spanish Fork, as well as two international teams from China. “It is really about creative problem solving and thinking outside the box,” Dana Dellinger, the director for WSU’s center for technology outreach, said. WSU’s Engineering, Applied Science and Technology College, the northern Utah chapter of the Utah Air Force Association and Utah’s Aerospace Education Foundation came together to make this event possible. Julie Nance, who is an eighth grade science teacher and a supervisor for the Spanish Fork junior high team, said she was impressed with the work the students put into this challenge. The teams were given a limit of a half hour to demonstrate their mechanism and were required to explain how the mechanism worked before giving this demonstration. 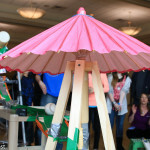 The challenge changes every year, and this year’s challenge was to build a mechanism that opened an umbrella as an end result. They teams were given a minimum of two hours to set up their mechanism in the area. Capanna is a WSU alumni and software engineer at Hill Air Force Base who volunteered to be one of the judges for the event. One restriction the teams faced was that the mechanism had to fit within a 10-foot-long, 10-foot-wide and 8-foot-tall space. None of the parts of the mechanism were allowed to go outside of that space. The teams were also encouraged to use items around them instead of purchasing products. “We definitely learned more about problem solving because every time we had a problem occur, we had to figure out the best way to fix it,” Kelly York, a student from Spanish Fork Junior High, said. 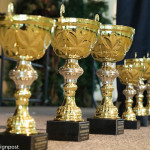 In addition to in-person competitions, there are also online versions available for those who want to participate but who are unable to travel to a competition location. However, students within 150 miles of a location of a live competition are encouraged to compete there, rather than enter in the online competition. 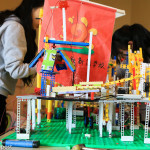 To find out more about the Rube Goldberg Challenge and upcoming competitions, visit their website.